​A cemetery has been vandalized in West Bridgewater, MA (29 miles from Boston). An astounding 33 gravestones have been toppled and smashed. This is the 5th time this cemetery has been attacked, and each time, the graves of Veterans have been a primary target. All attacks occurred a fews days before or on a day that honors Veterans: Memorial Day, the 4th of July, Labor Day, and Veteran’s Day. And now this fifth attack, once again on Memorial Day. While looking into "cemetery attacks", I discovered something horrible. There have been alarming numbers of Christian and Jewish cemeteries attacked and desecrated in "western" countries in neighborhoods where there are rising numbers of Muslim immigrants. This is a contemporary phenomena, not something that would have happened decades ago--or even one decade ago. Citizens of "western" cultures do not destroy the memorials of their dead. 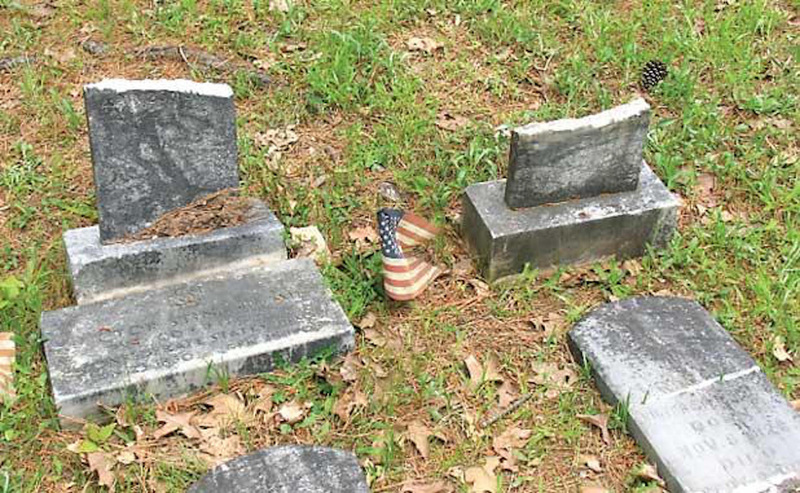 This rise in the desecration of Christian and Jewish cemeteries has explicitly come with Muslim immigration. Christian cemeteries are routinely destroyed in Libya, Algeria, Syria, Iraq and elsewhere in Muslim majority countries; and now this behavior has arrived in America -- as the Muslim immigrant population rises. And guess what? While doing research I found that the desecration of this cemetery in Massachusetts coincides with something else: a proposal for a 55-acre Islamic cemetery in Dudley, Massachusetts. What is disturbing is that the proposed Islamic cemetery will be located in a rural, non-Muslim town with a population of only 11,000 people. The Islamic Society of Worcester, who bought the 55-acres and who plans to make the land an Islamic cemetery, has stated that the cemetery would be for about 500 Muslim families. A spokesperson for the Islamic Society stated that this cemetery is for Muslims living in the "county" of Worcester. But if the entire county of Worcester only has 500 Muslim families, why do they need such an enormous cemetery? Why can't they use existing cemeteries? Each and every town in Worcester county has a local cemetery with plenty of empty plots available. Why does the Islamic Society want such an enormous cemetery? Because the Islamic Society knows about the massive numbers of Muslim “refugees” who are on their way to Massachusetts, Connecticut and Rhode Island. The town of Dudley lies on the border of three states that are about to receive enormous numbers of "refugees". Americans are being scammed. Truth is being deprived to us when it comes to "refugees"; the locations of their arrivals, and who they are. This Islamic cemetery is not for "500 families living in Worcester county". This cemetery will be for many thousands of Muslims. The whole character of New England is about to change. Refugees will soon be arriving at 13 refugee relocation centers in Massachusetts, seven of which are near the proposed Islamic cemetery. Also close to the proposed Islamic cemetery are two refugee centers in Providence, Rhode Island, and four refugee centers in Connecticut. These sleepy little rural communities are going to have thousands of Muslims relocating in their towns, and in all likelihood, a mega mosque will be built to accommodate them. Attorney Jay Talerman, who is representing the Islamic Center of Worcester, stated that the town has no way to stop the cemetery from being developed. He says "religious uses" are exempt. This mean that a mega mosque can be built on the 55-acres alongside the cemetery. Don't be fooled into complacency thinking this isn't coming to a neighborhood near you -- it's happening throughout America. It is being done deviously and the consequences are becoming apparent: cemetery attacks and attacks on churches (see below regarding churches being desecrated in Massachusetts). As the "refugees" arrive, mosques will be built, complete with giant loudspeakers that blast the call to prayer five times a day. Where mosques are built, property values drop and local businesses struggle--often forcing the locals to move. This is happening throughout the US. Muslims purposefully pray outside of mosques in order to fill the streets and public areas to make their presence felt. They block traffic, parking and pedestrian walkways. But its even more serious than that: Mosques are used for the promotion of Islamic doctrine. And Islamic doctrine requires the application of Islamic Law within its "geographical reach". According to the teachings of Mohammad, a Muslim community in a non-Muslim country must remain separate and distinct. Mohammad outlined the rules for immigration of which all Muslims follow and which is taught in all mosques. Mohammad stated that Muslims must form a separate body and keep their own laws and eventually make the host country comply with Islamic laws. Mohammad’s teachings forbid Muslims to immigrate if they are doing it to pursue the goal of their own personal gain. But if they immigrate with the goal of spreading Islam and making Islam victorious, or at least if this is a part of the reason for their immigration, then; according to Mohammad, they are allowed pleasure and personal gain. Mohammad said that Muslims who immigrate should never integrate with the native society. With this drastic rise in Muslim population via the addition of Muslim "refugees" will come more attacks on our cemeteries, churches and synagogues. Photo below left: Allah is painted on the base of a statue of the Virgin Mary and her upper torso spray painted black at a church in Norwood, MA. 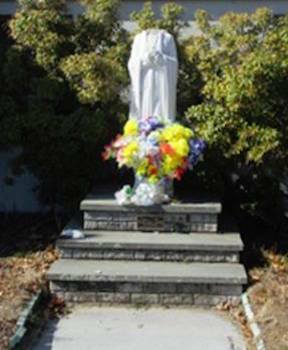 Photo middle: statue of Virgin Mary decapitated at a church in Billerica, MA. Photo Right: Head and hands chopped off of a statue of the Virgin Mary at church in Burlington, MA. 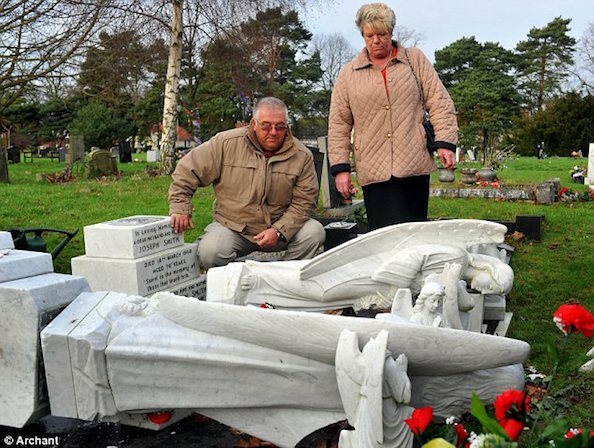 Above left: Christian cemetery in UK desecrated, statues of angels and Virgin Mary toppled and smashed. 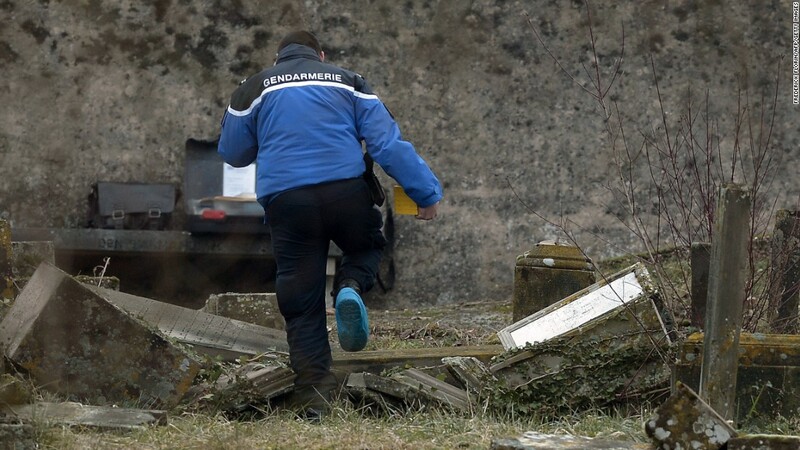 Above right: a Jewish cemetery in France completely destroyed. ​Right: large Christian cemeteries in Libya and Iraq have been destroyed.